Only The Saturday Evening Post delivers solid reporting on the who, what and why of today with a nod to the past and an eye on the future. Now you, too, can enjoy the original source for insightful, entertaining coverage of the American scene. 1 year subscription for only $15! Get a 1 year subscription at 58% off our annual cover price! Your satisfaction is important to us! If you're ever disappointed, simply let us know at any time and receive a full refund for all unmailed issues, no questions asked. 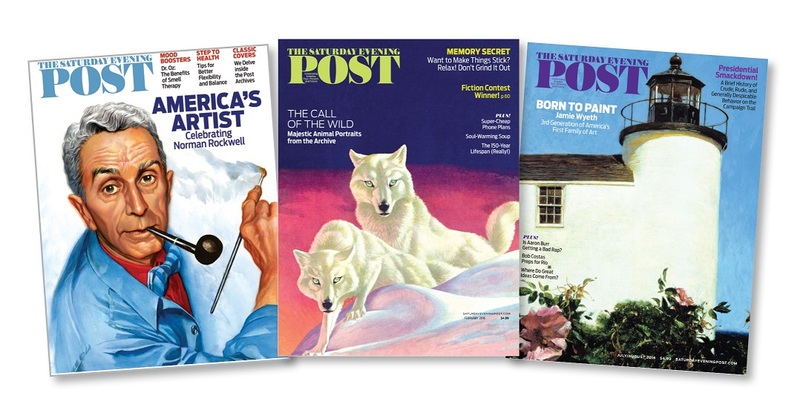 The Saturday Evening Post is published 6 times a year at the annual cover price of $35.94. Canadian and foreign orders: Add $16 per year (plus GST/HST), U.S. funds pre-paid. Please allow 6-8 weeks for delivery of your first issue. Customer Service can be reached by calling 1-800-829-5576 or by email. Members: If the post office notifies us that your print subscription is undeliverable, we have no further obligation unless corrected delivery information is received within one year. Your membership supports the mission of The Saturday Evening Post Society. Ninety-eight percent of the basic membership is apportioned to the fulfillment of the magazine. Copyright © 2018 The Saturday Evening Post Society. All rights reserved.